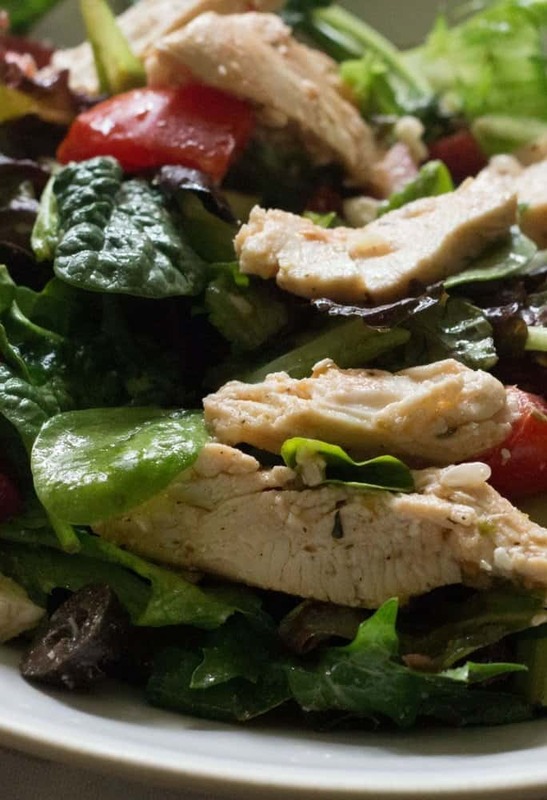 Easy Greek Chicken Salad is a quick and nutritious recipe! 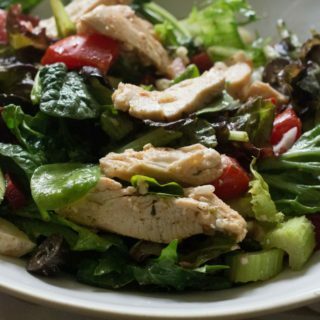 Made with a salad dressing that I use a portion to marinate the chicken breasts! I reserve the rest to blend with the greens and veggies to make awesome Mediterranean flavors in one tasty salad! A great make ahead salad for meal planning and perfect for a mason jar salad! Anyone else like me during the day and realizes its 3 pm and you have not eaten any lunch? That was the norm until I decided to plan ahead my meals. It does not take long at all and believe me, I feel a lot better now! 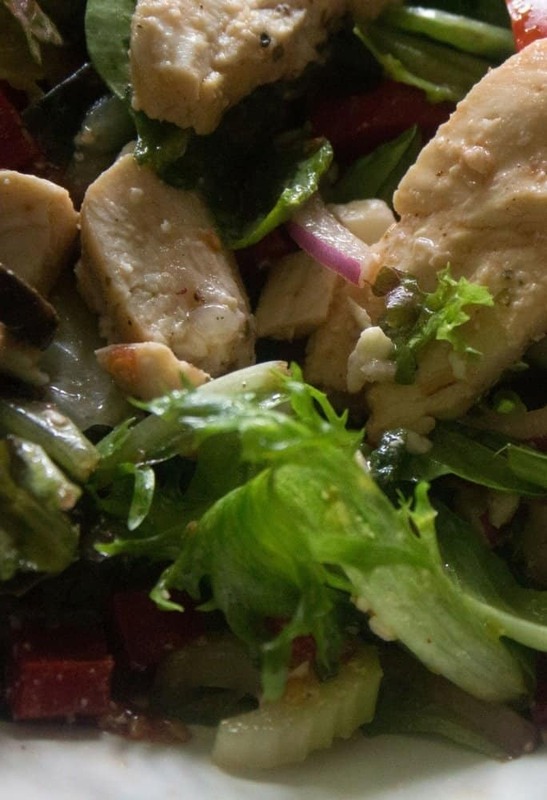 This Easy Greek Chicken Salad is a regular in my plan ahead meals. It’s not only delicious and quick to prepare put also I make a lot of chicken and it freezes well! When I see chicken breasts on sale, I always buy a large amount and make freezer bags with different marinades, each with a pound of chicken inside. I keep in the freezer until needed. As the chicken defrosts, it is also marinating! I also make extra and keep cooked chicken in the freezer bags. Always ready for a quick salad, quesadilla, or wrap. I do the same with my Easy Grilled Buffalo Chicken Lettuce Wraps! This is a light meal and as always, swapping out proteins are always an option. This is amazing with shrimp, scallops, flank steak, and for tofu fans, the flavor combo is epic! I have also added sun dried tomatoes and artichokes! Let your Mediterranean flavor ideas take over! 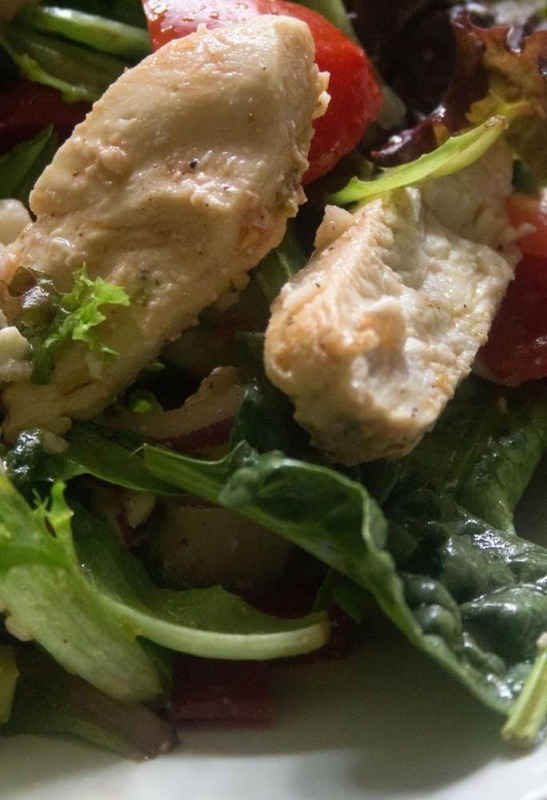 Easy Greek Chicken Salad is made with a marinade that I use a portion for the chicken breasts! I reserve the rest to blend with the greens and veggies! A great make ahead salad for meal planning and perfect for a mason jar salad! To make the marinade, in a medium bowl combine red wine vinegar, olive oil, garlic, Dijon mustard, oregano, salt and pepper.. Whisk to combine the flavors. Check seasoning, adjust if needed. Set bowl aside. In a glass bowl, add the chicken breasts and 1/3 cup of the marinade/dressing. Cover with plastic wrap and refrigerate to marinate. I prefer at least 4 hours to combine flavors. To cook the chicken, heat a saute pan over medium heat. Add the chicken and saute about 5 minutes per side. Cooked chicken reaches internal temperature of 165 degrees. Remove chicken and let cool slightly. Slice into 1 inch pieces. 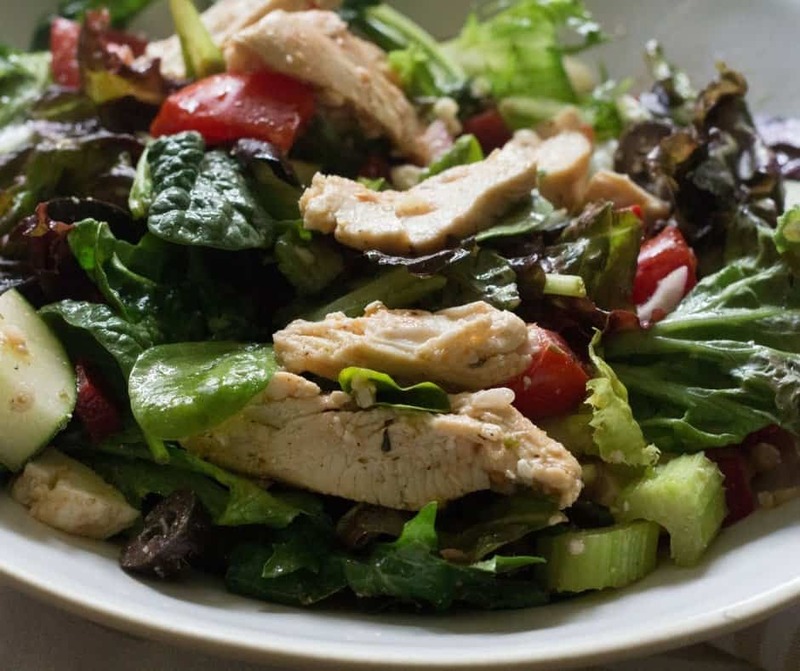 To assemble the salad, in a large bowl add the salad greens, Roma tomatoes, celery, red onions, Kalamata olives, red peppers, feta cheese, and sliced cooked chicken. Top with remaining salad dressing/marinade. When I make this recipe, the amount of dressing I make is more than I need for this salad. I prefer to have leftover dressing to use throughout the week. I use the dressing within 4 days. If you would like to make this a mason jar salad, the ingredients would be, starting at the bottom of the jar: dressing, feta cheese, kalamata olives, tomatoes, celery, onions, pepper, chicken, lettuce. This is how I make it and the ingredients stay fresh. You made my day April, enjoy the salad for lunch!